They are types of actions, which may be attributed to every time record in the account and can be used for distinguishing beneficial and non-beneficial activity and for assigning a price to your work. Activities can also help you systematize your business and find out how you spend your time across the whole account. 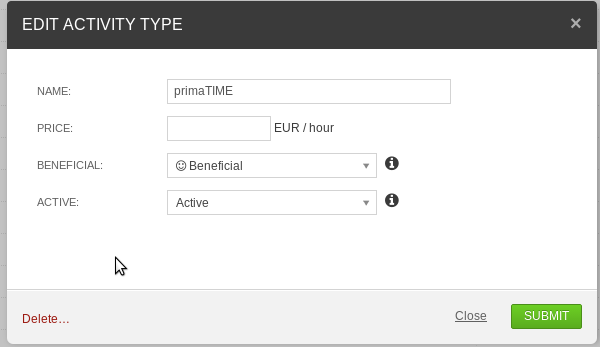 By setting an hourly rate to each activity and assigning them to your projects, you can calculate your income in real time and automatically generate reports and timesheets to invoice them. This will save you a lot of time and paperwork. Evaluate the benefit of your work. Price your work and create reports for invoicing. 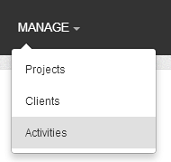 Click on the "MANAGE" option in the main menu and choose "Activities" in the sub-menu. You will then see the list of Activities created. Click on the "+ ACTIVITY" button. The Create Activities window appears, complete the information of the Activity. Method 2: While creating or editing time records. In the window for creating or editing a time record, simply click on the "+ Add row" besides the activity section. 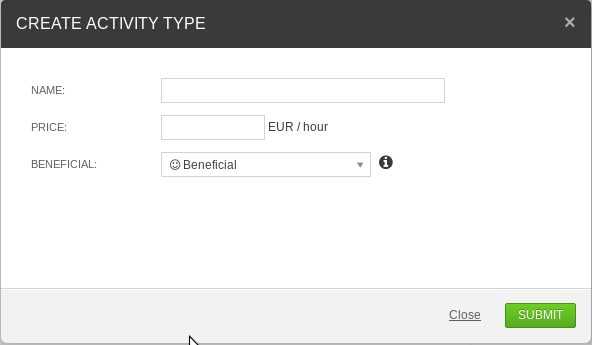 Then if you want to assign a price or determine if the activity is beneficial or not, you can edit it later. Name*: Designates a name to the Activity. Price: Assign the hourly rate for this activity. Beneficial: Mark the activity as beneficial or non-beneficial. Attributes the quality of beneficial to the activity and will affect the results of the beneficialness of the time records which it is assigned to. Note that if you select the option non-beneficial, the time records created using this activity will be automatically considered as non-beneficial. Click on the activity you want to edit. The Editing Activity window appears, make the required changes. The option "Active" indicates that the activity is in effect. While this option is enabled, the activity may be assigned to any time record. Note that any changes in the information of the activity don’t affect the created time records, they only take effect in the new time records. This ensures the reliability of the information registered in primaERP TIME TRACKING. Delete: Removes the activity from the system but the time records created, which include this activity, will remain intact. Deactivate: The activity is considered inactive. You will not be able to assign it to new time records, but this action will not affect the already created time records, and will allow you to access the information of the activity or reactivate it at any time.